Ragi (Eleusine coracna) is rich in calcium, iron and amino acids. 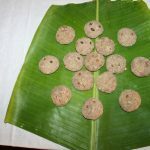 It is also famous as red millet or finger millet in the world. 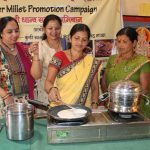 As gluten free millet Ragi is the most exported millet from India. But it is hardly eating in our day to day’s life. 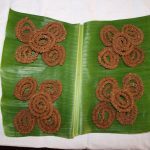 In Maharashtra mostly Ragi roti is made but children do not like to eat ragi roti. 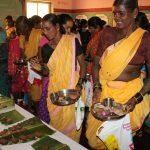 So it was a challenge for the parents to prepare different nutritious recipes from ragi to promote the consumption of ragi in children. 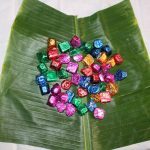 Parents came up with innovative dishes from ragi like, Idli, Dosa, Appe, noodles, Modak, wraps & rolls, cookies, Papad, chakli, Mudde, Momos, laddus, Halwa, Parothe, Theple etc. 55 parents from primary and secondary school division participated in the competition. It was great Treat! Parents presented the dishes very attractively; it was also treating for eyes! Botonist Dr. Nagesh Tekale, Ms. Nina Naim from Climate Action, Sweden & Ms. Jyoti Khopkar from Srushtidnyan was in judging panel. 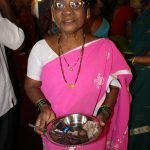 Dr. Nagesh Tekale explained the importance of ragi in our diet and other than taking pills of calcium and iron we should use ragi in our daily diet. 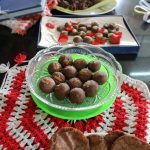 One fact he shared with parents that if ragi ate with vitamin c (lime juice) the iron is absorbed within 10 minutes in the body. 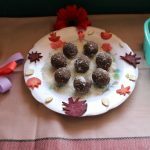 The parents were inspired to use ragi in their daily diet! All the participants were felicitated with certificates and winners with prizes! Kundi is the village situated at the foot hills of Western Ghat in Ratnagiri District. Villagers are cultivating organic Finger Millet and selling it. Ragi is eaten in form of roti or Bhakri in this village. 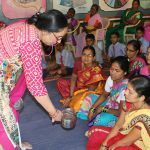 Srushtidnyan conducted Finger Millet Recipes Training Workshop for women in the village to promote the use of Ragi on 9th March 2017. Dr. Pratap Naikwade explained about the importance of Ragi as a rich source of calcium and iron. 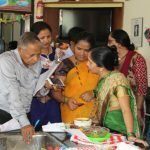 Ms. Jyoti Khopkar & Ms. Sangeeta Kharat demonstrated different recipes that can cooked for household purpose and some recipes that can be sell with value addition. 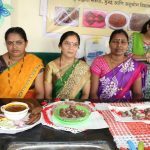 Women were very happy to participate in such kind of programme and tasted so many recipes of Ragi first time. 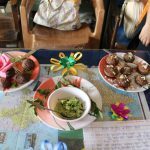 All the dishes like Ragi Idli, Dosa, Soup, Halva, Nankatai, biscuits, chocolates, Chakali, laddu were demonstrated in this workshop.